Motherwell crashed to a disappointing 3-0 defeat at Ross County in Saturday’s Scottish Premiership clash. 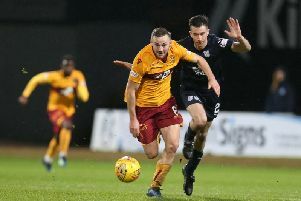 County moved seven points ahead of ‘Well in the table with a victory which puts a severe dent in Motherwell’s hopes of landing a top six spot. The Fir Parkers are down in 11th spot and facing another battle against relegation. Motherwell started marginally the better side, with Louis Laing and Jake Taylor making starts in place of suspended Stephen McManus and injured Joe Chalmers. But County took the lead on 24 minutes when Craig Curran sent a right footed volley into the postage stamp corner after being set up by Martin Woods. Well’s Josh Law was then booked for a 28th minute foul on the far touchline. Lionel Ainsworth had Motherwell’s best effort on goal after 34 minutes when he shot just wide of the right hand post after a great run. Trailing 1-0 at the interval, Motherwell produced a poor second half showing. Stephen Pearson was booked for a lunging foul on Marcus Fraser, before the Well midfielder’s zipped cross from the left after 58 minutes was just missed by Louis Moult. A great 40-yard run by Well’s Marvin Johnson down the left on 66 minutes set up sub Theo Robinson, whose scuffed shot was saved by keeper Gary Woods. The killer second goal arrived for County on 71 minutes when Tony Dingwall rounded keeper Connor Ripley and tapped the ball into the empty net. The visitors almost pulled a goal back seven minutes later when Laing’s long range shot only just missed the top right corner. ’Well again almost scored on 89 minutes but Liam Grimshaw’s close range shot was saved. County broke straight down the other end to win a penalty for Kieran Kennedy’s foul on Liam Boyce. And it was Boyce himself who stepped up to send the spot kick high into the net. Ross County: Woods, Boyd, Curran (Schalk 74), Foster, Dingwall (De Vita 71), Irvine, Woods, Fraser, Boyce, Davies, Franks (Murdoch 84). ’Well: Ripley, Law, Johnson, Kennedy, Laing, Pearson, Grimshaw, McDonald, Moult, Ainsworth (Cadden 62), Taylor (Robinson 58).